I decided to go ahead and update my blog two days in a row. Not because I think it needs to be done, but because I am afraid to go into the other room and see the mess my kids have made since I have been on the computer for 10 minutes. I keep making the boys come in here so I know they are still living and breathing, and I hear Ansleigh playing in her jumperoo... but that doesn't mean that the carpet, furniture and toys are unscathed. As I was skimming through other people's blogs, I found one by "mormon mom." Whoever it is- not that you are a blog lurker like me- just in case you read this- thanks for saying the things most of us don't take the time to! I really do love being LDS. I don't thank my Heavenly Father near enough for the blessing I feel that I earn because of the things that are taught by the church. There are things that many people find odd about our religion, and maybe some of the things are a bit odd, but I am thankful that I have such a great reason to be part of something odd! I'm pretty sure that most of the people who read my blog are LDS- although a select few may not be, but just so you all know, I am greatful, thankful, and blessed to be part of it! I give thanks to those who came before me that were brave enough to shoulder the persecution that came along with being a member of the church when it first was restored. I have read numerous accounts about all of the things that people went through and I can't honestly tell you that I would have stuck it out through all of it. I wasn't there, so how can I say it? I know for a fact that one of my great-great-great-grandfathers was a bodyguard for the Prophet Joseph Smith. He must have gone through some pretty horrible things while being so close to him. Because of him, however, I am here, as a Latter-day Saint- and proud of it. I'm through rambling... as I have most likely said the same thing in many different ways. 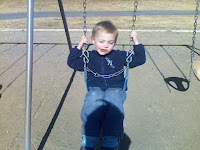 Here are some pictures of the kids at the park last week- it was a blast for all involved! 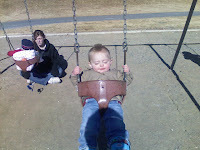 Here is Ansleigh loving the swing. It sort of looks like she has a nubbin for her right leg- and I laughed so hard! McKie being the little weirdo that he is! I love that kid! 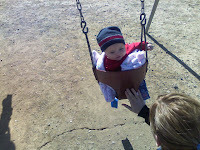 Brensyn could swing all day long if I'd push him! 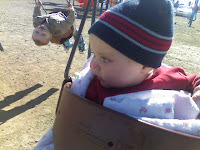 I had to add this one, not so much because of my beautiful little girl, but because of Brensyn in the background- it's hilarious! PS- Just checked on the boys- and they were sitting quietly on the couch watching Kai Lan! Yay boys for not being naughty! Hey, are you still in Cowley? I haven't checked my blog for a few days, so I wasn't sure. If you are, give me a call! We would love to hang out! I'm a little weary of posting my phone number for everyone to see, so just call either my mom or my mother-in-law (both in the phone book) and both would be happy to give you my number!